Photo UNU by Luis Patrón. Imported food is changing people’s dietary habits and introducing lifestyle diseases in many of the world’s tropical island states. One reason is that the transition to a modern economy has made food self-sufficiency both unprofitable and unnecessary. At the same time, this aspect of globalization has reduced hunger and may become a necessary part of climate change adaptation. “Traditionally, fishermen in Belize combined fishing and farming, and were largely self-sufficient. Today, farming brings in too little [money] to be worthwhile, while fish exports and tourism provide revenue for society,” explains Marianne Karlsson of CICERO (the Center for International Climate and Environmental Research – Oslo). Karlsson and Elizabeth McLean (of the University of Rhode Island) interviewed fishermen in Belize and the Dominican Republic about how they are experiencing climate change and vulnerability as part of the Many Strong Voices programme (MSV). Actually more of a constellation of researchers and organizations, the programme aims to communicate the complexities of climate change, and to gather information that makes islanders capable of making knowledge-based decisions. What the pair found is that only a few fishermen still combine fishing and farming, and almost all of the fish they catch are exported. Chicken and other imported processed food, containing high levels of sugar and fat, increasingly dominates their diet. Some of the people Karlsson interviewed said that they wished they could eat more of the fish they catch. “One of the people I talked to was very tired of chicken, and wanted a more varied diet,” she said, adding that diabetes and obesity are widespread problems in Belize. Heavy dependence on imported food makes fishermen more vulnerable to changes in international food prices, while commercial fisheries are vulnerable to escalating variations in weather and wind. Fluctuating food prices and changing weather conditions may be direct impacts of climate change, but nevertheless, not all fishermen see climate change as a critical threat. Fishermen in Belize have observed changes in weather conditions, but according to Karlsson, the fishermen say that change is something they have always had to deal with — and in any case, most believe “it is God who controls the weather”. They feel rising fuel prices and fisheries regulations are more important, since these affect them more immediately than climate change. Ilan Kelman is a Senior Research Fellow at CICERO where his fields of research include adaptation to climate change by small island developing states. He points out that, like those who live in wealthier countries, islanders are part of a globalised world and also want more product choices and a wider variety of goods in the shops. “Commercial fisheries provide an income, and make it possible for people to buy other kinds of food than fish. Why would everyone want to eat fish every single day of the year if there are alternatives?” asks Kelman. He explains that over the course of centuries, many tropical island communities developed a culture and a way of life that made them resilient to climate change and variable weather. Life was hard, but they were largely self-sufficient. “Hunger was part of their lives, even though famine was rare,” says Kelman. But as in all other societies, the islanders’ lives are changing. International trade, new foods and commercial fisheries have reduced hunger in many island communities, and there is no longer the same need to be self-sufficient. Furthermore, climate change may actually make it difficult for island states to be self-sufficient. As the sea level rises and storms become more frequent, saltwater may infiltrate the groundwater and soil and make it difficult to grow crops. A rising sea temperature is likely to cause bleaching and death of coral reefs and changes in fish stocks, so that it will be more difficult to make a living from fishing. 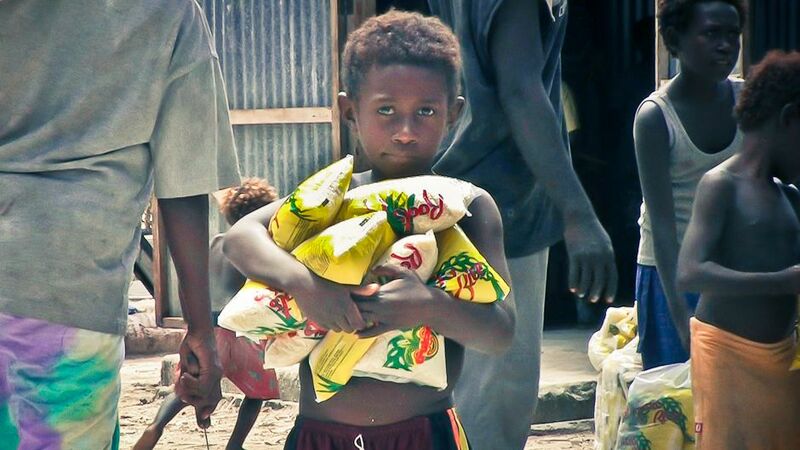 Food imports may become essential to the survival of remote island communities. “Importing food may become a large part of a strategy for climate change adaptation,” says Kelman. However, importing food introduces new problems. According to the Pacific Islands Forum, a number of Pacific island states are facing an epidemic of lifestyle diseases. These are partly the result of a diet containing high levels of fat and sugar. Lan Marie Nguyen Berg spent six months on Tuvalu in 2011, in order to conduct an information project on climate change and how it affects the people of this remote island state. As a result, she ate a lot of imported food during her stay. “On the main island of Funafuti, 80% of the food is imported,” she explains. Most of the imported food consists of products that do not spoil during transport — canned food, rice, oil and other products containing high levels of carbohydrates. The effects on the population are evident. “People’s weight has increased,” says Berg. However, she explains that about half of Tuvalu’s population lives on the smaller islands, and so far they are not as dependent on imported food. “On the smaller islands, people eat more fish and local crops — taro, pulaka and breadfruit. But these crops are being threatened by the intrusion of saltwater into the soil, which is very porous,” described Berg. Kelman points out that small island developing states are not unique in depending on imported food, and that obesity and an unbalanced diet are serious problems in rich countries of the world as well, since people in these countries have already widely adopted unhealthy eating habits and a reliance on imported food. We should not think of islanders as automatically more vulnerable than we are, or expect them to live a more traditional lifestyle than we do. According to Kelman, the important point is that island peoples must have the opportunity to manage their own development and to decide for themselves how to deal with the challenges facing them. “The key to success is to look at the wider perspective, and not focus solely on food, water or climate change. We need to look at the whole picture, including the islanders’ way of life and the way their societies are developing,” he concludes. For more information about small island developing states, watch this CICERO video featuring the author of this article. Small islands, big food concerns by Eilif Ursin Reed is licensed under a Creative Commons Attribution-NoDerivs 3.0 Unported License. Eilif Ursin Reed works in the information department for the Oslo based climate research institution CICERO. He has a background as a writer and a freelance journalist. He is currently working for the Many Strong Voices project.